Looks like there’s going to be a new theme! Here’s a little sneak preview of what the new site is going to look like. I’ve been spending most of the day trying to tweak the blog into something more tasteful, vibrant and most importantly, incorporating larger images for my photos. So yeah, this is kinda what I was looking for, for those who happen to be browsing the blog tonight may or maynot have actually seen the theme in action (was the easiest way to show friends and folks) but otherwise we’re still using the old one. The theme was built from scratch and should work on previous posts, older posts will have some pixellated photos but meh! But yeah, let me know what you think. Thought I’d update you on some new features here and there on the blog, nothing worth talking about but you know, if I keep talking about gigs you’d think I’m not actually a geek! There’s still lots of backend stuff that I occasionally do out of curiosity and for coding pleasures (mmm code). Today I’ve been doing a bit of plugin shopping and downloaded/installed two useful plugins, a flickr photo album plugin and a google site map plugin. The latter is mainly used for informing google and other search engines of newly updated posts and whatnot, I’m not really seeing any immediate benefit from it but I hear it’s useful *shrugs*, I kinda got bored reading it’s use on wikipedia (and I find it weird how my readers are actually reading this for me if they dare click on the wikipedia article). 800×600 users can goto hell! Haha sorry 800×600, i still love you and everything but I thought this was quite a punchy title for a post and all. Right, more geeky blog changes. Kinda wished I wrote this with the other one but hey. When coding sites and blogs we make sure everyone can read it nicely and easily. If you look at most blogs and sites their width is about 760px or so. Reason being is that this means users with 800×600 resolutions can view the page without too much hasslehoff in terms of horizontally scrolling the page in order to view the content. Most people have stuck with this and that was all fine and dandy. But it also meant that most webmasters are restricted to damn 800px wide websites in order to conform. Content usually should be minimal but sometimes it’s just annoying knowing you can’t benefit from the extra width, so I’ve decided that I’m more or less going to screw the 800×600 users and make a w i d e r site. Upon more research I’ve also looked at my stats to see what kind of resolutions you guys have and the results are quite interesting, only 1.12% of folks visiting my site have the oldskool 800×600. So really I’m not killing off too many users with prehistoric monitors. So what triggered the decision? Well, one of the biggest examples of sites that are doing this is good old www.facebook.com, notice that the newer site is actually wider now? This is so that they can fit more status/wall update goodness into your page (as well as ads) at the expense of those poor 800×600. Expect the update to happen very soon, I need to create new background images for the header (just wider, not killing off katamari). I tweaked the blog a wee bit so now there’s actually a search bar at the top, it bugged the hell out of me when I was talking to someone about a post I made and had to painfully trawl through the posts to find what I was on about, so yeah, enjoy the lovely new search bar, I had a lot of fun styling up the search results page so it looks all nice and neat and whatnot or notwhat. The all kinds of crazy search bar! In addition to that I thought I’d direct the attention on you LiveJournal users that I do actually have a lovely LJ feed account (thanks Stephie for making it) that you can subscribe to, so if you’re an avid fan of Livejournal and would like to have all my entries fed into your friends page, then feel free to add me and read up it up in the comfort of your own custom stylesheet (I almost make it sound homey!). Add me on LiveJournal + roar! Tonight will be an awesome night because I shall be heading to the hoods of Shepherds Bush and checking out some hot Brazilian Electro Music from a band you all know as CSS. Hopefully it should be a biblical riot. I suppose while we’re on the subject of blog changes, feel free to drop me a comment if there’s any features you’d like on the blog to help you navigate around it, and since I haven’t used polls in a long time and we’re on the same subject, here’s a poll. Yes, that is a killer list haha, doubt you can read all of it! Hello folks, don’t know how much you’ve been checking out my site for updates and all but I am proud to say that crazybobbles.org is finally back! As announced on my blog (well you’re reading it now) I’m migrating my blog to crazybobbles.org since it makes perfect sense. I’ve recently got a job so it was simply too hard to manage so many sites in one go, now I will be able to manage both my blogging and muse updates in one. This won’t be an entirely Muse related blog since I’m very sure you have more awesome sites (microcuts, muse.mu and musewiki) for your news reporting. It wouldnt be a good idea to release a site to simply repeat what other more experienced and developed sites report. So yeah, makes sense. The selling point (or niche) is you’ll be getting a informal array of posts about Muse from an old time Muse fan who’ve seen them far too many times. More insights and discussion fuelled posts which you won’t get on other sites. 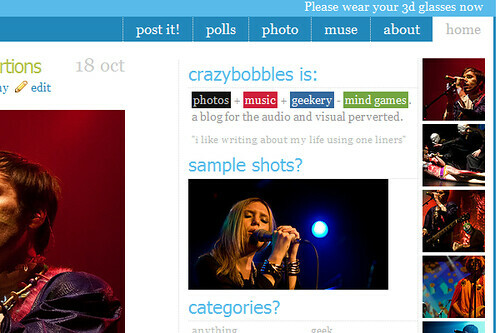 I want to keep my vibe from the old site of having a site about musers, and not Muse. I will also integrate my musewiki updates on here which will in turn feed into the wiki to keep those who like to wiki informed of new developments, got to love integration eh? Not only will I be updating about Muse here, I will start redoing my covers here and give them some life. That was the original purpose of my site so it’s only fair to start doing them again. I’m looking at using various sites such as youtube and myspace to host and spread my covers too so hopefully it will be awesome. Some songs were simply too cringeworthy so hopefully you’ll see a new refresh of covers that I’m happy about :). Think that’s about it, enjoy the new site, more changes of the blog can be found on my previous posts. Read my old personal posts too if you want 😉 get to know more about me and my horrid past haha. Will be looking forward to giving you more unadulterated blog action. Hope you enjoy my new theme, take care and hope to see you soon (yes my blog is a living entity capable of “seeing you”).